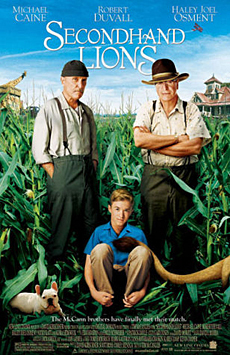 Based on the recommendation from some good friends, I recently watched the movie Secondhand Lions. It’s a movie about a kid who has an irresponsible mother and is sent to spend the summer with his wealthy uncles in Texas. The movie is really good. Without spoiling it, the two uncles spent a considerable amount of time in Africa and fought in a bunch of wars fighting Arabs and probably just about everyone else. They were able to capture a bunch of gold from a sheik and since growing old have lived on a farm in Texas. The film portrays these with a lot of visuals and it reminded me of the movie The Princess Bride. Not sure why, maybe it’s because they’re both stories to an extent. Everybody thinks they’re really rich and dozens of salesmen call at the ranch. The reason they are rich is unknown to most. The consensus is that they were bank robbers. Nobody knows. The movie starts out with a shot of these two guys shooting guns into the water at catfish. It pretty much goes from there and has a high quality comedy count. Overall though, it’s a story about a kid growing up, two guys growing old, and family values. Highly recommended. I watched the DVD version which has a number of extra features, deleted scenes, behind the scenes and interviews. Interesting tidbits you can learn from the IMDb: the director also wrote the screenplay for The Iron Giant and Haley Joel Osment (who plays Walter) was the actor who portrayed Forrest Gump (the younger Forrest Gump). It gets (drumroll) five movie moons (an unusual rating mechanism I invented). Update: Here’s some box office financial info about how Secondhand Lions did.